And this is Exhibit-A why Joe screamed for Dirk Koetter to abandon his outrageous no-mandate, no-veto policy for his defense. Hearing Koetter reference that policy a month ago led Joe to unhealthy activities. Joe is just now recovering. That’s how mind-numbing it was. As bad as the Bucs defense was earlier this season, it made no sense for Koetter to be so hands-off on that side of the ball. Koetter needed to get in there and use his deep knowledge of defensive weaknesses, and even bring Todd Monken in to scrutinize the defense and fix the historic mess. Instead, Koetter punted and relied on Mike Smith to heal the broken defense over the bye week. It was like asking a doctor who brutally botched your thumb surgery to go back in and give it another shot. Everyone saw the result of that decision in Atlanta and Smith got fired hours later — something Koetter said would do no good just a couple of weeks prior. Enter Dave Moore, the veteran of 15 NFL seasons is paid by the Buccaneers to break down film and be one of the best Xs and Os guys in the business on Buccaneers Radio Network broadcasts. Moore does a fantastically fair and balanced job. Speaking on WDAE-AM 620 this week, Moore was excited about the defense’s steady growth and he gave Duffner a lot of credit. “Duffner came in about six weeks ago and obviously he’s got a different philosophy a little bit than Mike Smith,” Moore said. The ex-Bucs tight end talked about how postgame quotes from defensive players reveal that things have been simplified for them and they now better understand their positioning and where their help will be. Moore added it’s clear defensive players have been given a green light to take more chances and they have responded to Duffner’s changes. “That defense has gotten a little bit better every week under Duffner, and they’re playing their butts off for the guy,” Moore said. Imagine that. Simplification, aggression, and responding to a passionate coach. Shame on Dirk Koetter for sticking with Smith so long. Shame. Koetter often says the NFL is a week-to-week league. Well, a couple of precious weeks of holding on to Smith might have cost this team and this aching fan base a precious win. Same goes for Chandler Catanzaro. It’a crazy that Duffner has done a better job WITH more injuries than Smith dealt with. ADDED NOTE: I also think what Duffner has done is to give our defensive personnel more opportunities to MAKE PLAYS. These guys are all professional football players. They want to MAKE PLAYS. Having them play 10 yards off the ball (like Smith did) and just tackling them underneath for short gains over and over never gave the secondary much of a chance to make plays. The same goes for running more blitzes. When players MAKE PLAYS they get fired up and their teammates get fired up. Giving up soft coverage 3-7 yard completions over and over and over all day is demoralizing for a defense. Keeping his BFF on THAT long, along with the QB mess, is why Koetter will be looking for a new job come 2019. I give coach Duffner credit, he was handed a historically BAD defense, and made them play hard, and are showing how this team could have been in the hunt for the playoffs. Might also have cost him his job. I mean the statistics are kind of alarming between Smitty & Duff this year. Like an insane discrepancy. Not sure how you blame that on the Tampa 2 Mafia or whatever other weird conspiracy you’d have to invent to defend Smitty. Duff has had a less healthy group of players if anything. He didn’t use any excuses in terms of the personnel he had in terms of playing soft coverage. Not sure how many times Realist made that argument – about Smitty being unable to blitz or play tough coverage because it’d mean we’d get roasted. Will Smitty Sycophants like Realisto ever wake up and admit that the dude has been hot garbage since the defensive collapses against Dallas and New Orleans in 2016? Will they ever admit that he is sole reason that this defense was on pace to be the worst defense in NFL history? Come on now Joe…….what’s taking you so long ? By now you should have had at least 3 or 4 of those cutting edge and oh so funny intros for Duffner. I mean, I can’t stop laughing everytime I read about Dirk Bit-O-Honey snacking, Yam eating….blah , blah, blah. It’s really the funniest thing I’ve ever read, and I’m just hoping you can do even better with Duff. Over and over and over and over and over and over? I hope Duff admits that he likes wearing lingerie while listening to Ira say Joe’s name every 12th word. Maybe he even lets it slip that he likes Bon-Bons and frying bacon while naked? I mean hey Joe, how great and totally hilarious would that be? The Peter King one, the original I suppose was funny because it was kinda new and different. But dang Joe, you just keep one-upping yourself and all of us diehard fans just can’t get enough of your astute shenanigans!!!!!! Joe Joe Joe. Throwing shade at the coach while supporting the QB. Make up your mind. Is two games of success enough of a representation for a QB and not the HC? In my opinion you can’t keep your Bell Cow turnover machine without his Guru. Jameis has looked good in Koetters offense the last two weeks. Duffners D has looked good. But you throw shade at the HC? Come on man. Be consistent. Record turnovers are cool? But keeping the HC as he finds his footing in the system isn’t? You want a new regime after your guy has two good games? Thats messing with undeniable success LOL! This team would be in the playoffs had Smitty been replaced after last season. What happened Realist? Is he Mike Smith’s new driver? shame on joe for shoddy reporting!!!!! 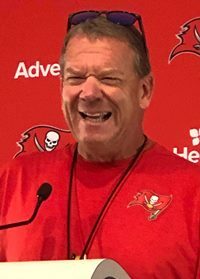 Coach Koetter said that they began to “simplify” the defense the week before the bye week!!!!! Funny how when the defense played bad, it was because of the ole scheme, and when they play good it is because they listened to duff!!!!!!! I don’t know what is sadder, the local media reporting on football, or the sheep that need to be told what narrative to think!!!!!!!!!!!! Just remember sheep, its the coaches holding this whole team back!!!! Right???????????? You can see a more agressive style of play now, that much is obvious. It seems as though a big reason why our defense is playing better is the production of our Dline. Those guys are eating lately. Combine that with playing tighter to the receiver and bam, turnovers started happening. So yeah, obviously Duff Man has this team playing more aggressive and whatever he did to “simplify” things is working well. Also having your General on the field of battle with you makes a huge difference. I think of Braveheart, how he rallied his troops and pumped his men up. Kind of hard to do from your AC booth a few hundred feet away. I still think Koetter should be the coach next year. In this case, consistency is a better option than uncertainty. Koetter can win a SB in the next 1-3 years. Holding on to Smith was a bad idea. But, Koetter has the #1 offence in the NFL! I think that achievement trumps the mistake of firing a guy later than you should have. Things work together. Some of the sacks were really coverage sacks. When you press and challenge, the QB doesn’t have the easy quick throws that first defeat and then demoralize the rush. And, some of the blitzes have been cleverly disguised. Two of four sacks by linebackers last week, both untouched straight to the QB. bucs bandit, that a amazing and true statement about the difference in what Duffner has done with so many players injured and what Smith done with the starters. by switching to an anti-spread defense (5 defensive backs), and moving towards the spread on offense, the bucs are finally moving in the right direction. 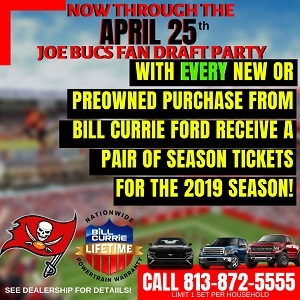 i dont like winston, but rpos are helping to bring the bucs out of last place, and hopefully we wont go back for a while. Has everyone noticed how the players and other coaches (Buckner) had been attracted to Duffner? The guy is obviously very likeable and he’s a team player. Highlights of him and Buckner talking plays on the sidelines proved he values the opinions of others and is willing to consider all options. I would be in favor of keeping him as our new DC here on out. We may have struck gold fellas. Maybe he was,is the defensive coordinator this team has been looking for. Now go get him the right coaching staff because this guy has been pulling it off with an injury riddle roster and 3rd stingers and practice squad players. I have to repeat myself: The time for firing Smitty was after the debacle in the dessert in week 6 of the 2017 season. Show me a good game by the D after that! Understanding that whoever the defensive coordinator is here next year, he’ll let these kids (and probably more of them) play press coverage. I read this morning that, for some reason you can’t have Grimes playing “off” and the rest of the guys playing press. And off coverage is what Grimes has always played, and up until this year and maybe last, excelled at. It makes me wonder what guys like Vernon Hargreaves and Ryan Smith and Carlton Davis and MJ Stewart, and another kid who we don’t even know his name yet, will do in that scheme. Hell, it makes me wonder what Jonathon Banks might have been. Member him? Defensive Rookie Of The Year? Please tell me that you’re being sarcastic. I can see 60-something year olds getting a chuckle out of these but I’m sure to most it’s just mindless filler that is skipped or skimmed over every single time. No offense to the Joes, nor am I asking them to stop, but I’m sure most people don’t find it funny but they accept it as one of the quirks of the JBF web site. You have to take chances on defense in today’s NFL. In bygone days, giving up a big play was really bad because it was not more likely than not an offense would score on any given possession. Today, in order to stop an offense you have to put them in a down and distance hole at some point. So you have to take risks to try and get their offense off the field. Higgs and Kisses all around! !